The JM Internet Group is a publisher of books on digital marketing. The company is announcing a new list of popular tutorials on search engine optimization for small businesses. SEO tutorials are an easy first step into the world of digital marketing. The JM Internet Group, a leader in online SEO training, is excited to announce its list of the best SEO tutorials for small business beginners for 2017-2018. Published as part of the upcoming 2018 update to the popular SEO Fitness Workbook, the list is an easy way for small business owners and marketers to get started at search engine optimization. "There are many decent SEO tutorials on the Internet amidst the noise and churn of cyberspace," explained Jason McDonald, Director of the JM Internet Group. 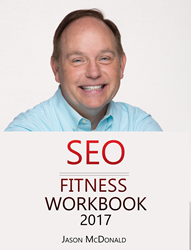 "We are expanding the SEO Toolbook that is published as companion to the 2018 SEO Fitness Workbook and felt that a short list of the highest quality SEO tutorials for beginners would be worthwhile." To view the list of tutorials, visit https://www.jm-seo.org/2017/11/seo-tutorials/. Anyone interested in SEO - from beginner to expert - can learn a few things by quickly clicking over to them. They are ranked with the best and/or most important listed first, starting with the classic "Google SEO Starter Guide," which is Google's own explanation of what to do to get to the top of search engines. As part of the forthcoming new workbook, it should also be noted that the JM Internet Group maintains a popular list of the best books on SEO at https://www.jm-seo.org/2015/05/best-seo-books/. This list of top books helps readers find the most current authors on everything related to search optimization, and that - in combination with the companion SEO Toolbook - is part of the book's strategy of "never stop learning." Planned features for 2018 include a checklist in each Chapter of "action items" and online quizzes so that readers can test their knowledge of Google, Bing, and Yahoo optimization. Small businesses today can thus use the resources provided by the JM Internet Group as an entryway to the world of digital marketing. First, it is suggested that they visit the website and avail themselves of the no cost resources such as this list of SEO tutorials. Next, they can read the company's lively blog and subscribe to its email alerts. The company produces a zero cost "tools dashboard" as well that compiles the best tools for optimization efforts. Finally, they can graduate up to purchasing the SEO Fitness Workbook on Amazon or even taking one of Jason's online course taught at Stanford Continuing Studies. In this way, the JM Internet Group produces content for every need from beginner to established practitioner. The point of the methodology is to break down search optimization into manageable parts. The JM Internet Group provides SEO, Social Media Marketing, and Google AdWords training and courses for busy marketers and businesspeople. Online search engine optimization training helps explain keywords, page tags, link building strategies and other techniques needed to climb to the top of search engine rankings for Google, Yahoo, and Bing. The teaching methodology is hands on, with live examples and discussions, taught from the convenience of each student's computer. It should be noted that the company maintains important book lists such as its list of the best SEO books and the best social media marketing books.